JEFFERSON, WI (Saturday, May 18, 2013) Dale Nottestad of Cambridge charged to the front of the field on Saturday night at Jefferson Speedway and drove away to capture the B&M Electric 50 lap feature. The win marks Nottestad’s second in a row at Wisconsin’s Action Track as he battles for a spot at the top of the standings. Brandon Pendleton and Craig Phillips paced the field of 18 of the area’s best Late Model pilots as the green flag flew to start the action. Pendleton grabbed the early lead on lap one with Ryan Goldade sliding up to second. On lap two, Goldade made his move to the front of the field as he drove to the low of Pendleton. The duo raced side by side until Goldade took control of the point on lap four. Tory Bagley followed past Pendleton for second just as the first of two cautions waved on lap ten. As racing resumed, Nottestad made his way into the top five. Nottestad squeaked by Pendleton for third right before the second caution waved on lap 14. Once the green flag returned, Nottestad continued his trek to the front, moving past Bagley and setting his sights on Goldade. On lap 17, Nottestad dove under Goldade entering turn one. The pair of drivers battled wheel to wheel for a lap until Nottestad gained possession of the lead on lap 18. Nottestad began to stretch his lead as the laps ticked away. 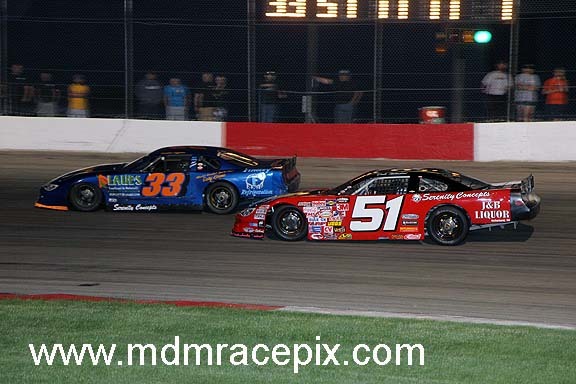 Zack Riddle continued to slice his way towards the front with Casey Johnson following him through the field. Riddle managed to get to second in the closing laps, but Nottestad was well on his way to taking home the trophy for the second week in a row. At the checkers, it was Nottestad by a wide margin followed by Riddle, Johnson, Goldade and Bagley. Jim Tate Jr of Deforest continued his dominating ways in the Sportsman division by claiming his fourth feature win in as many weeks while also accomplishing the clean sweep for the second time this season. Jim Taylor grabbed the initial lead on lap one with JC Stanelle running second. Taylor began to pull away from the rest of the pack while Stanelle tried to hold off the competition and Tate entered the top five. Tate began picking off cars one by one until his was alongside Stanelle on lap six. Tate made quick work of the second place machine as he started to close the gap on Taylor out front. Tate caught the early leader on lap eight, clearing on the next circuit and beginning to check out from the field. Tate’s advantage grew lap after lap as Jason Thoma picked his way to toward the front. Thoma moved into second with six laps remaining, but Tate cruised to the stripe to get the win. Thoma settled for second with Steven Sauer, Taylor and Seth Lootans rounding out the top five. Defending champion, Mike Lambert of Madison, claimed victory in the 20 lap International feature event. Dylan Buckingham briefly grabbed the lead on lap one, but Casey Strese used the low side to shoot past Buckingham to complete the opening circuit. Joe Cross followed into second on lap three with Dan Birkett in his tracks for third. A caution on lap nine slowed the pace, but once racing resumed, Lambert made his move into the top three as he got by Birkett. On lap 15, Lambert slipped by Cross for second and started to close the gap on Strese at the front. With two laps to go, Lambert pulled up to the rear bumper of Strese. As they raced into turn three, Lambert dropped to the low side of the speedway, drawing even as they flew past the white flag. Lambert held the advantage down the backstretch on the final lap as he pulled out front to take the checkers first. Strese was second with Cross, Birkett and Jamie Shelley completing the top five. Edgerton’s Bobby Selsing Jr took advantage of an early caution to grab the lead and drive away with the win in the 25 lap Hobby Stock main event. Anthony Lloyd led lap one form the pole with Jeff LeFave and Peter Shelley battling for second behind him. Shelley appeared to gain control of second before a huge melee exiting turn two collecting a large portion of the field to bring out the caution. Several cars were relegated to the rear of the field for the restart handing second to Selsing with Jason Deppe in third. As racing resumed, Selsing charged under Lloyd entering turn one. Selsing cleared for the top spot by the next corner as Lloyd dropped to second. Deppe got around Lloyd for the runner up spot on lap 15 while Selsing continued to show the way. James Helmer joined Deppe in the fight for second, but contact between the two drivers on lap 16 sent Helmer to the infield. Tony Ciano and Dustin Ward found their way behind Deppe by lap 19 as they fought for third. Selsing continued to stretch his lead as Ciano and Ward made their way to second and third respectively on lap 23. At the checkers though, it was Selsing with the big win. Ciano finished second followed by Ward, Deppe and Lucas Buckingham. In Road Warrior action, it was Chad Olds of Whitewater taking the honors in the 20 lap feature event. Olds and Jason Haas led the field to green with Olds taking control of the point on lap one. Chester Williams followed into second with Travis Schneeberg running in third. Williams and Schneeberg entered into a side by side battle allowing Olds to open up a healthy advantage in the lead. Rob Lange joined the fight for second on lap 12 with Williams and Schneeberg still door to door. Williams briefly reacquired the second spot with Lange making his way by Schneeberg for third. Lange got around Williams on lap 15, as he tried to cut into the large lead that Olds was enjoying. Lange ran out of laps in his quest to catch the leader as Olds saw the checkers first to pick up the win. Lange settled for second with Williams, Bill Sweeney and Schneeberg rounding out the top five. Waunakee’s Brandon Riedner grabbed the lead on lap one and hung on to get the win in the 20 lap Bandit feature event. Riedner took control entering turn one on the first lap with Tyler Deporter up to second. Derek Dixon began to use the high groove to move forward, claiming third on lap three and drawing even with Deporter for second on lap four. Dixon cleared for the runner up spot on lap six as he began to reel in Riedner at the front. On lap eight, Dixon began peeking to the outside of the leader. The sole caution of the race flew on lap nine for fluid on the racing surface placing Riedner on the point for the restart with Dixon right behind in second. Dixon once again tried to use the outside groove to make the pass. But on lap 11, Dixon got loose and was tagged to the infield handing second to Nick Schmidt. Schmidt applied heavy pressure to Riedner over the closing laps, but Riedner hung on to cross the stripe first for the win. Schmidt was second followed by Keith Erickson and Devon Dixon. Next Saturday, May 25, is a full program in all divisions highlighted by the Pepsi 50 lap Late Model feature as well as One on One Street Drags. And don’t forget about round one of the Tournament of Destruction on Sunday, May 26. Jefferson Speedway is located halfway between Jefferson and Cambridge on Hwy 18. Please visitwww.jeffersonspeedway.com for more information. Nottestad Notches First LM Feature at Jefferson Speedway!